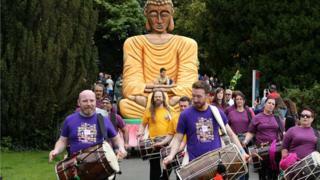 Thousands of people have attended the annual Mela festival in Belfast on Sunday. The festival, held in Botanic Gardens, is one of the biggest multi-cultural events in Northern Ireland. It featured international music, dance, food and visual arts and was organised by ethnic arts group ArtsEkta. The chair of the Community Relations Council said that the festival showed that growing diversity in Northern Ireland is "unstoppable". "You see the event getting bigger and bigger every year," said Peter Osborne. "You see so many different communities here. Local communities but also from Poland, or from the Ukraine or Russia. "Chinese community, Indian community, Hindus, Muslims, Christians all together celebrating what is good about humanity as a whole." He added: "I think everybody here is giving a message out. What they are saying is that those haters are not going to divide us, not going to stop the changes taking place in this region." Nisha Tandon, executive director at ArtsEkta, said the event it had been a "fantastic, fun-filled celebration". "Mela is also a celebration of our continuing journey to become a truly shared and cosmopolitan society where communities come together harmoniously and with mutual respect. "If this is the face of our new Belfast, we can all be proud, happy and inspired."